Choosing a gemstone rather than a diamond, can give you the option of having a larger centre stone, as gemstones are often more affordable than diamonds. With an abundance of coloured gemstones to pick from, you can design a bespoke engagement ring that is truly unique. At Rare Pink, when it comes to choosing gemstones, we highly recommend sapphires for an engagement ring. Not only is a sapphire’s hardness high on the Mohs scale (a scale of mineral hardness), but this gemstone also comes in a vast array of beautiful colours. From the classic blue and pink hues, to the mesmerising peach tones of the padparadscha sapphire – there is a colour for everyone. If your partner has their heart set on a sizeable centre stone, then the halo is your best friend! The halo accentuates the size of the centre stone, giving the illusion that it is considerably larger. 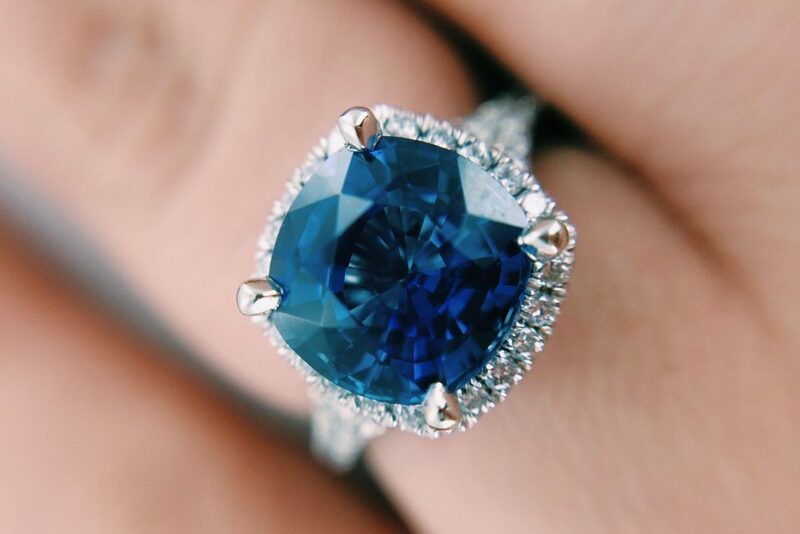 This bespoke creation is a classic example of how to beautifully use a sapphire in an engagement ring. If you have any ideas or ring aspirations, feel free to get in touch to discuss your ideas.